Ever wonder how your level of strength and fitness matches up against others? Today you’re about to find out with this timed, 250-Rep challenge. PART ONE: The participant must complete a total of 50 bench press reps.
PART TWO: The participant must complete a total of 100 push ups reps.
PART THREE: The participant must complete a total of 100 burpees. The participant must perform 50 total repetitions. Record your time, rest 30 seconds, move on to test two. The standard measure of strength across every military branch. The participant must perform 100 total repetitions. Record your time, rest 30 seconds, move on to test three. Exhausted yet? All participants must complete 100 repetitions of a full burpee, while clapping their hands fully over head (on the jump portion of the exercise) Also, the push up component to the burpee is not required. Record your time for all of the tests – deduct your “free” 30 second rest periods in between exercises/tests. 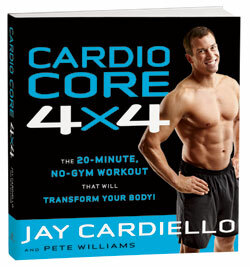 Jay Cardiello is a strength and conditioning specialist and the author of CARDIO CORE 4X4:The 20-Minute, No-Gym Workout That Will Transform Your Body! available at Amazon.com.